This time, there are no choices. Lucian "Lucky" Spark leads a double life. By day, he trains to become one of the Establishment elite. At night, he sabotages his oppressors from within, seeking to avenge the murder of his love, Digory Tycho, and rescue his imprisoned brother. But when he embarks on a risky plot to assassinate members of the Establishment hierarchy, Lucky is thrust into the war between the Establishment and the rebellion, where the lines between friend and foe are blurred beyond recognition. His only chance for survival lies in facing the secrets of the Sowing, a mystery rooted in the ashes of the apocalyptic past that threatens to destroy Lucky's last hope for the future. 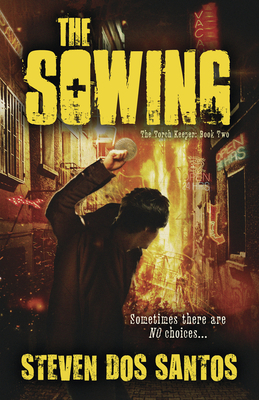 Perfect for fans of Suzanne Collins and James Dashner, the fast-paced action begun in The Culling--hailed by VOYA as "a heart-pounding page-turner"--continues in The Sowing. Steven dos Santos (Miami, FL) spent most of his working career in the legal field, even going to law school for a couple of years before realizing that if he was going to be telling "creative truths," he'd prefer to be writing novels.